Santino's favorite book these days is "Swimmy". I noticed that he has a tendency to fall in love with an element in a book, and then just project it everywhere. In one of his previously favorite books (actually, he still loves this one) the "Zack's Alligator", the alligator bites a mail truck tire. Santino talks about this particular moment all the time. 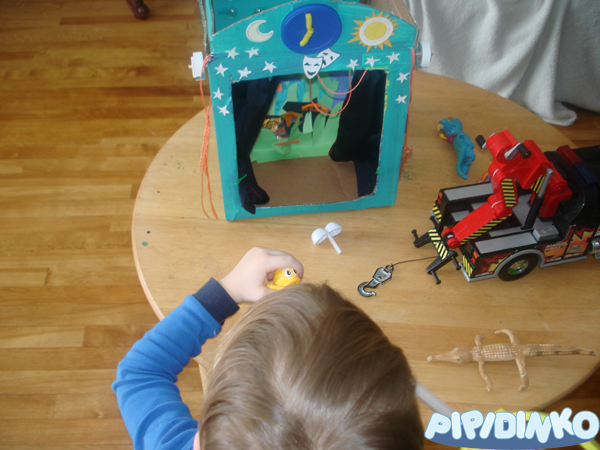 When he plays with his trucks or cars, one of the tires always gets "bitten off" by an alligator. In the "Swimmy" book, Santino loves the tuna fish. 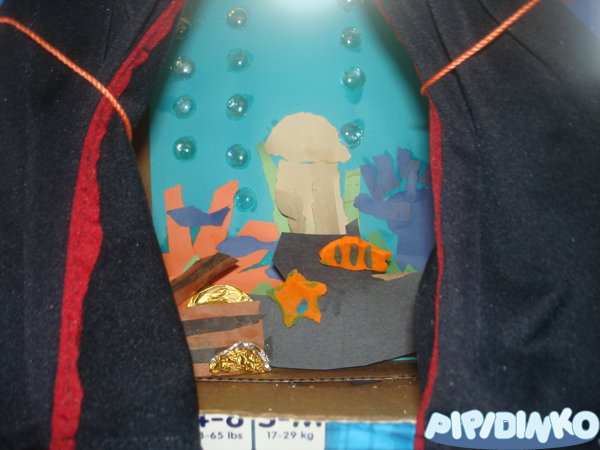 Since we don't have a fair size fish toy (except for a plush Nemo), Santino asked me once to make him a tuna fish with play do. I made a tuna fish, taught him how to make a snail, showed how to make a star fish, we also made an octopus and a clown fish. These were followed by all kinds of other different fish. We've been practicing how to roll the play do, how to squish it between the fingers, how to cut shapes out of it. This has been Santino's favorite activity in the past few days. Then I suggested we play with all those fish we made. 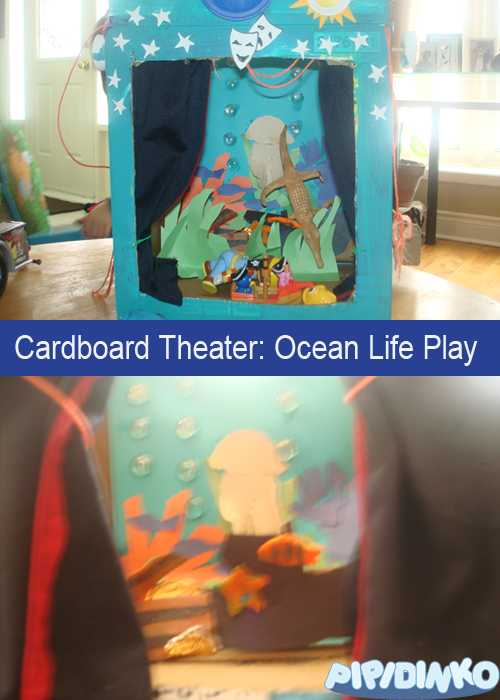 I pulled out our theater from the back of the room, and told Santino, that we will make another scene, an ocean backdrop. So we took down our volcano, and made a new decoration. 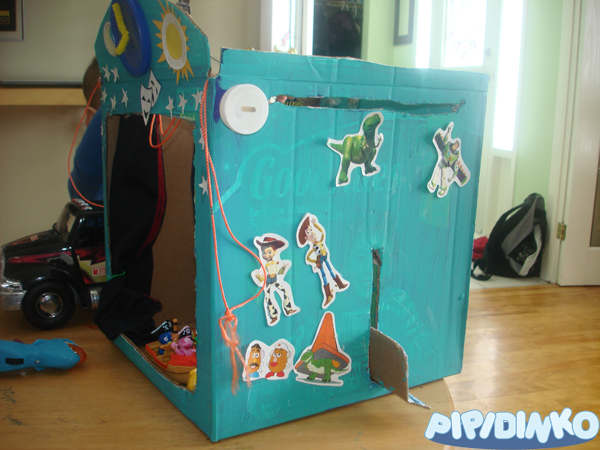 We used various pieces of construction paper, previously ripped or cut by Santino (I save those... you never know when you might need ripped colored paper). 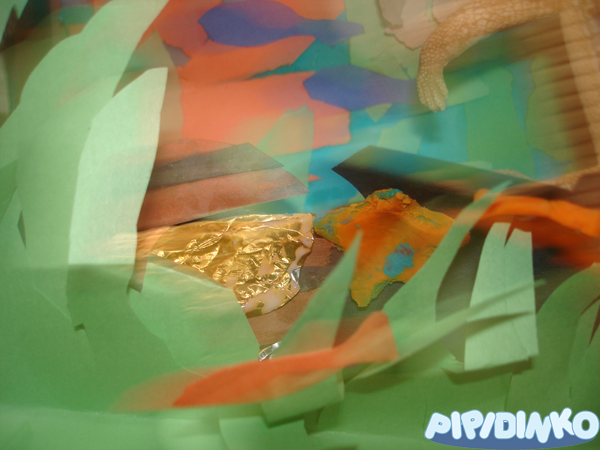 We glued those pieces on a blue sheet, arranging them so they pretend to look like coral reefs, jelly fish and sea weed. 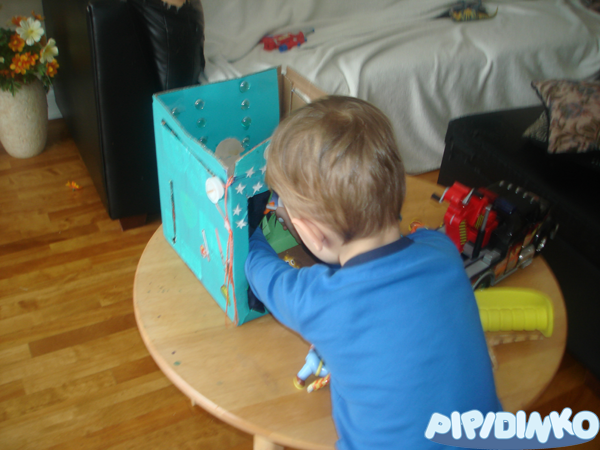 Santino helped me gluing everything in place. I glued some see-through glass beads for air bubbles. I also tried making a ship wreck, with a open chest standing next to it, flashing its gold. Meanwhile, we decided that our theater was due for renovation. I painted the outside walls, cut off the top flaps, sanded the ragged edges a bit. Santino glued some stickers on the walls. 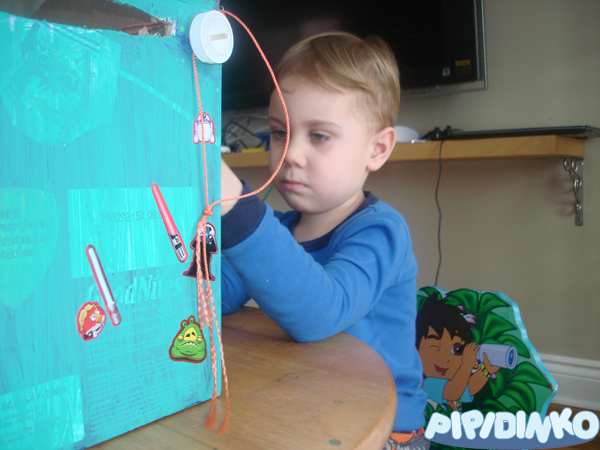 We made a clock with a plastic lid and a pipe cleaner. Then I made some stars, a moon and a sun (hmph... didn't actually make the Sun and the Moon, I simply cut the pictures with my scissors :) ), and Santino glued them on the front of the theater. 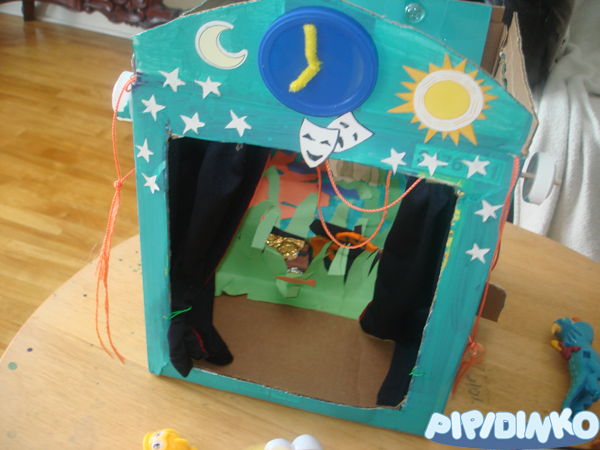 I even made the comedy-tragedy masks, to make sure that our box looks more like a theater. 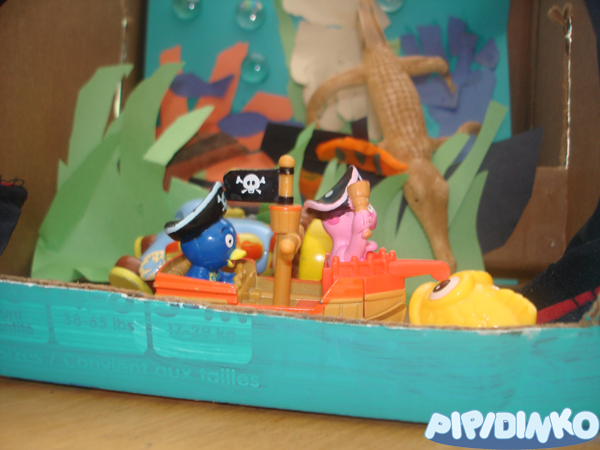 Then we found all ocean-related (and not so much) toys that we have, and Santino enjoyed quiet play time. Meanwhile, I drafted a couple of work-sheets by hand (I don't have a printer). Santino connected same words written in capital with those in lower case letters. 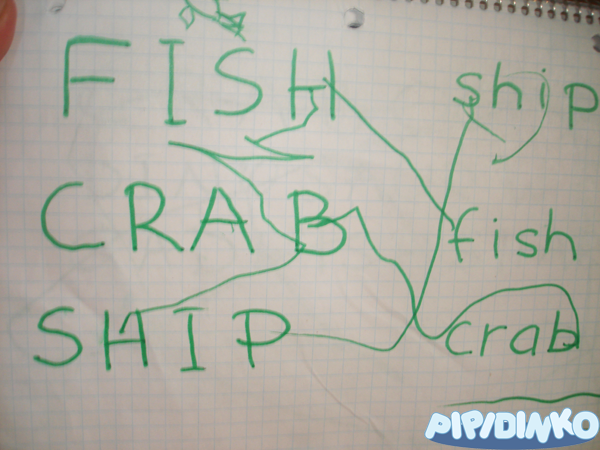 He also practiced writing letters, by connecting the dots, as well as making a fish picture. 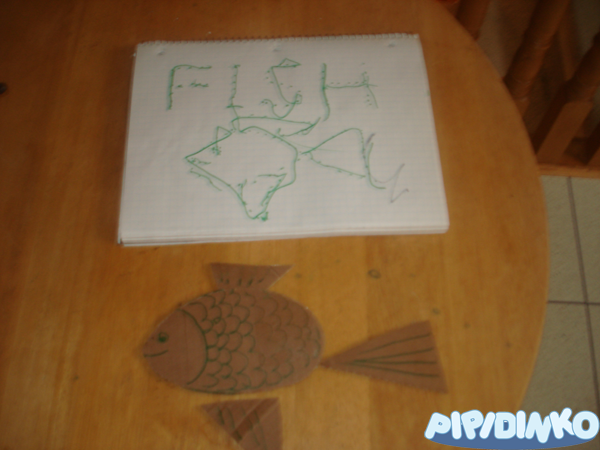 He then put together a small fish puzzle which I made for him out of cardboard. Basically, all this was done without any special plan, just as I felt, that Santino would be interested this time. I'm proud, how Santino recognizes the 'sh' sound. I just noticed, that he also connected the two 'sh' in two different words.